When new parents return to work after maternity/paternity leave, they are often noticeably more efficient than before. Managing family life, especially with small children, forces us into a tighter temporal corset, and that demands pretty rigorous self-management. Without it, we start missing things: a project deadline, closing time at the daycare centre, or the next vaccination date. At the same time, other competencies are developed in family life that carry over into the workplace. This includes an increased ability to tolerate frustration, more patience, and better listening. It also helps to develop personal resilience – an unavoidable learning, because yet another sleepless night is coming whether we like it or not. So much for the positive aspects of family life! From my own experience with two children, I also know the challenges that show up in everyday working life are only one part of a juggling act for parents who are also trying to make everything at homework too. When you get it wrong, it can be emotionally challenging – like when your child starts howling because they are surprised to learn you are headed off on another business trip, for example. Now that my children are a bit older, I am realising more and more how using some professional skills in my family life helps me to stay in control. We all know that the Getting Things Done® methodology factors in personal ‘stuff’ as well work, because dropped balls create stress, whether at work or at home. So my personal inbox is empty too, and actionable things are sorted into the logic of ‘next actions’ so I never forget my cleaner’s birthday or the ticket release dates for the next concert season. The realisation that both personal and professional ‘stuff’ ends up in one bucket in my brain anyway is certainly one of the most helpful messages that I took from my first exposure to GTD. For an overview of sports activities, school performances, orthodontic appointments, etc, a shared Google calendar helps us as adults. Meanwhile we have developed a talent for improvisation for the unforeseen: sick teachers, additional music samples, broken smartphones. But we noticed a gap: how to make the upcoming appointments and ‘to do’s’ more tangible for our children? We asked ourselves this question as a couple just over a year ago. The children should be well briefed – about their own plans and ours – so that business trips are no longer a surprise and there are fewer tears for all concerned. We introduced this overview in the form of a weekly family meeting – and freely used the ‘Weekly Review’ toolkit for this purpose. Our weekly meeting takes place next to a whiteboard in the hallway of our apartment, and lasts about 15 minutes – usually on Sunday after breakfast, or in the evening if the morning doesn’t work out. The focus is on the coming week, and the board therefore is divided into columns from Monday to Sunday. Everyone enters the most important dates with his or her colour and introduces them to the others, e.g. “Project day at school”, “7.30 in the office”, “Clarinet lessons”, “Aikido”. Or also: “Buy birthday present for girlfriend Sophie”. Originally, we had sorted the board chronologically by day, but after a few weeks our children suggested that everyone should use a different column per day AND a different colour for themselves, so they could understand it better. That worked better, and we’ve stuck with that arrangement since. • What do you need from us? Money for Sophie’s birthday present? • Are there any notes that we have to sign, e.g. for school/for sports clubs/etc, or messages from them that we need to know? • Do you still have to schedule time for learning, and do you have to come up with anything creative? Do you need help studying/with homework? • And last but not least: who will take over which household chore in the coming week? And who would like which favourite food? • Do we have to organise outside support on any day? As reference material, we stick tickets, or notes with signatures and the like, directly to the date on which they belong. The children then take what they need on their own. Of course we often add, delete or reschedule during the week – e.g. in case of illness. But the idea of a clear and up-to-date overview for everyone remains. For some readers this may sound like too much formality for family management. Our experience after around a year of this is that the children not only gain a better understanding of each other’s plans, but also find their way much better with their own daily lives, and become more independent and self-reliant as a result. Recently, researchers reported in the Journal of Experimental Psychology on the stress-reducing and sleep-promoting effects of to-do lists. In my little Sunday case study, on a whiteboard behind a Berlin apartment door, these results are confirmed on a weekly basis. 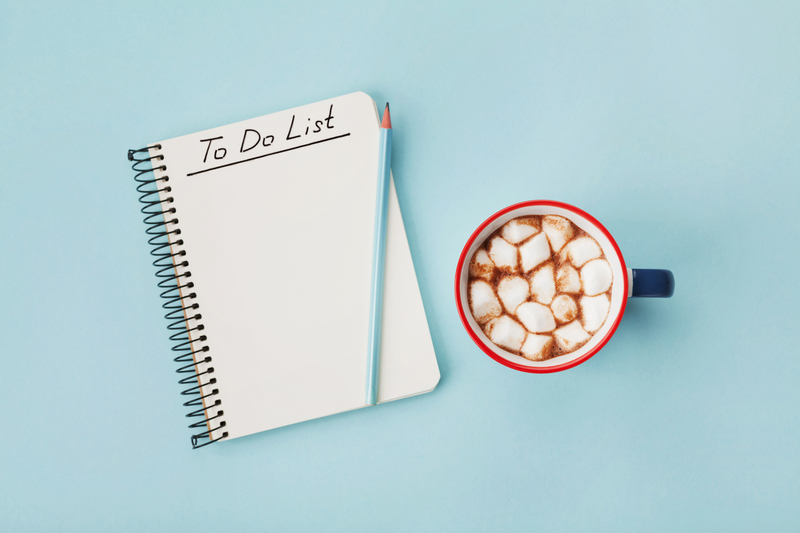 I can add another nugget to the scientific results: a cup of hot chocolate offers additional support to the stress-reducing effect of the to-do list, regardless of age. Can you take a pic for us?